From classic poetry to pop lyrics and from the King James Bible to advertising slogans, Mark Forsyth explains the secrets that make a phrase - such as `Tiger, Tiger, burning bright', or `To be or not to be' - memorable. In his inimitably entertaining and witty style he takes apart famous lines and shows how you too can write like Shakespeare or Oscar Wilde. 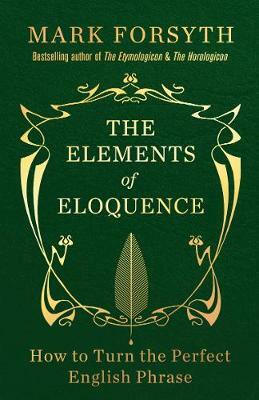 Whether you're aiming for literary immortality or just an unforgettable one-liner, The Elements of Eloquence proves that you don't need to have anything to say - you simply need to say it well. Rhetoric is a much maligned subject, often considered to be dull, sometimes even said to be dangerous, it’s high time someone set the record straight. What makes a memorable turn of phrase?